Our hand-crafted natural swimming pools are as good as it gets for you and for the environment. 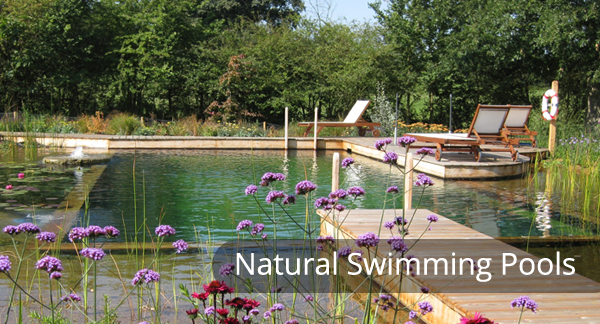 Natural swimming pools feature outstanding design with exceptional natural filtration techniques we have developed in the UK. Biotop ‘phostech ultra’ filtration eliminates excess algae. Maintenance is the easiest of any natural pool system. Enjoy stunning swimming and relaxation in a magical setting all year round. Surround the pool with lilies, reeds, rushes and iris, water mint and forget-me-not; watch hovering dragonflies and dipping swallows – and, if you are lucky, the occasional streak of a blue kingfisher. 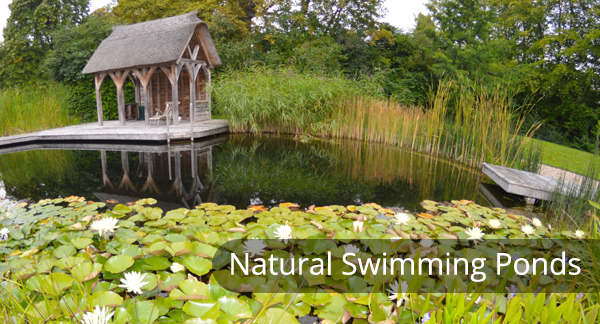 Simple, perfectly ecologically-balanced clean swimming in the most natural looking planted ponds available. Swimming ponds are our most natural solution for all year enjoyment and summer swimming. We use simple construction by digging earth walls and sheet lining. The plants and swimming areas are divided by banks so the pool can be easily vacuumed and kept much cleaner than a garden pond. They are self-balancing and, even with the filter strimmers switched off, can be left for months at a time to look after themselves. A beautiful pond with the lowest swimming pool cost possible. Our Natural Pools are built using our partner Biotop’s award-winning “Natural Pool System”.